Modern society is built on the idea of successive chains of refinement. Seeds are planted into soil, and then grow into wheat. Wheat is farmed from fields, and refined into corn. I think. I don’t know, I don’t think I’ve ever stepped onto a farm in my life. Corn becomes cornflakes, and cornflakes become breakfast. Cows turn into jumpers, and sheep into beef. Along the way, the raw products of labour become ever more specialised – every step of the process adds value, and if any link the chain breaks the whole of society breaks with it. The fragility of civilization is significant – it’s been said that we’re only four meals away from anarchy at any given time. Our food logistical systems are built on a ‘just in time’ model – there are no great stores of food in warehouses. Instead, most of it is on the motorways and highways as it is being freighted, as it’s needed, from one place to another. The intense sophistication of modern supply chains is fascinating, and in retrospect it’s a bit surprising that we haven’t yet seen this concept well explored in game design. That is at least insofar as we limit ourselves to the games we’ve covered so far on Meeple Like Us. 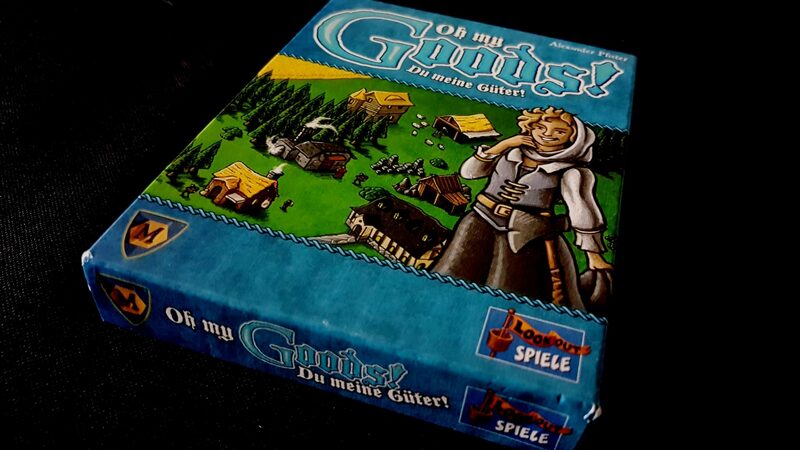 Oh My Goods though is, at least in part, a game about refinement. 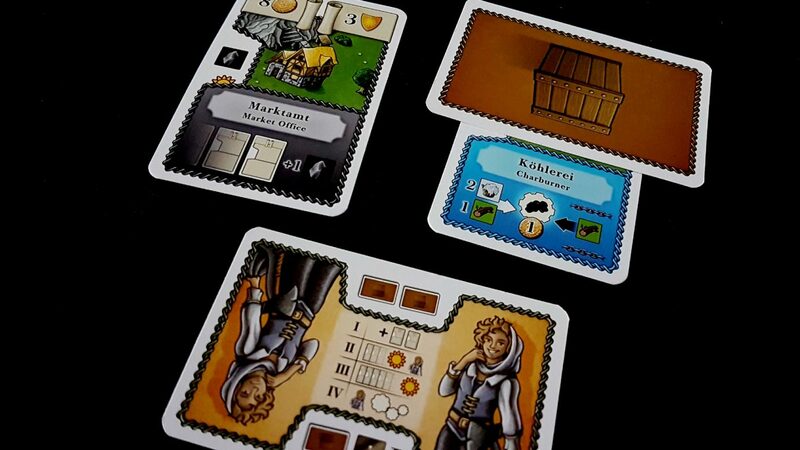 It’s also, fittingly, a very obvious refinement of the core formula of Port Royal – a slightly earlier game from the same designer. They share a lot of structural similarity – they’re both tableau builders in the San Juan mould. They’re both heavily invested in the idea of mutable meaning in card play. They’re both almost fetishistic in the way they endorse and exploit the human desire to keep pushing our luck beyond the stresses it can reasonably be expected to bear. We didn’t have a lot that was especially complimentary to say about Port Royal, but Oh My Goods is in many ways the game Port Royal should have been to begin with. It’s meaningfully similar but it’s far more interesting, and far more absorbing. And yet, frustratingly, it doesn’t quite manage to achieve the promise that’s expressed in the design. It is so close to being more than it is. Oh My Goods tantalises with subtle whispers of repressed greatness. It promises, but never follows through. To play Oh My Goods is to dip your head down towards the cool waters that would quench your eternal thirst only to have them recede out of reach. We begin our play of Oh My Goods with a handful of cards, a charburner of random disposition, and a worker that will either, at our command, work their little fingers to the bone or half-arse their way through the day’s job with all the grace of a sullen teenager. Our charburner begins with seven cards placed atop it – these represent either money (gained by selling the coal produced by the burner at one coin per card) or actual lumps of coal we might throw as components into some alchemical processes later on in the game. If they’re in our hand, cards might also be buildings that we could construct with the money we accumulate. Our job in Oh My Goods is to ride the volatility of the free market in a way that leads us into the riches and power that are our birthright. We do that by making sure we have a sufficiently diversified portfolio of investments to win regardless of what’s going on in the world around us. 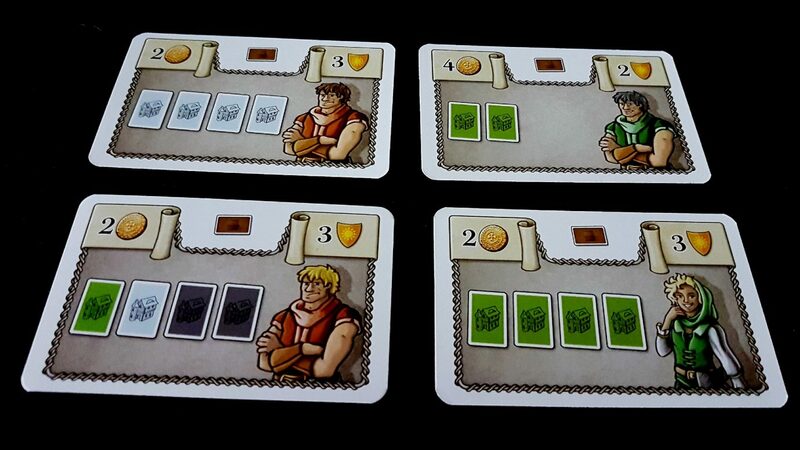 Each turn, the current player deals out a number of cards from the draw deck. 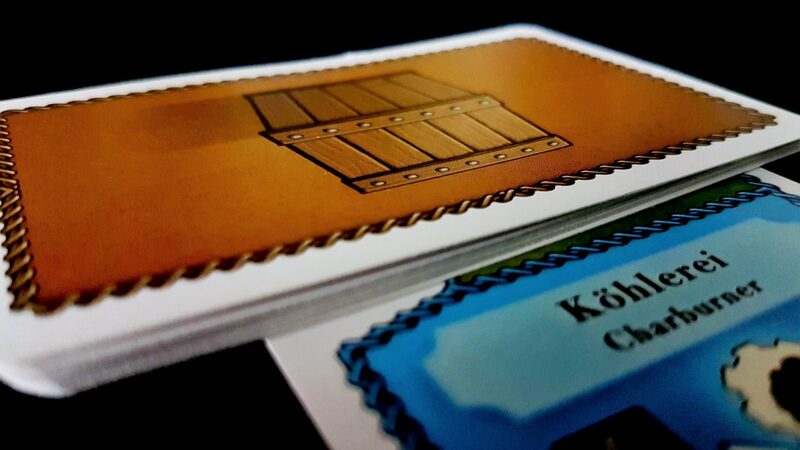 These cards represent resources that are available in abundance in the marketplace, and they’re used by our worker to produce the goods in the building to which we assign them. If we don’t have the goods we need available, we need to discard the missing resources from our hand. Marketplace cards can fuel every building, but cards in our hand can fuel only one, and only once. If a building is fueled with its requisite resources, it produces and we become richer, fatter, and happier. It’s not quite that simple though because the number of cards that get drawn in a round is variable – we draw until we have seen two half-sun symbols appear in the row. Some cards have them, some cards don’t. At the point the second sun is drawn that phase of the day is over and everyone has to take stock of the options they have available. Every player has a charburner, but every char burner needs different resources. It’s unlikely that you’re going to be able to produce in any of your buildings from the draw in front of you, but the good news is there will be a second draw. The bad news is you need to decide on your staffing and construction agenda before the second draw is made. In this it’s a little like in a game of Texas Hold ‘Em where you choose to gamble on the strength of a starting hand. Your worker can be assigned to any building you have constructed, and later in the game you might also have access to apprentices that can be staffed at buildings in which you don’t want to waste your worker. You get to choose how hard they’re going to work too. A worker building efficiently needs to have all the resources available, and in return will produce two of that good during the game’s production phase. 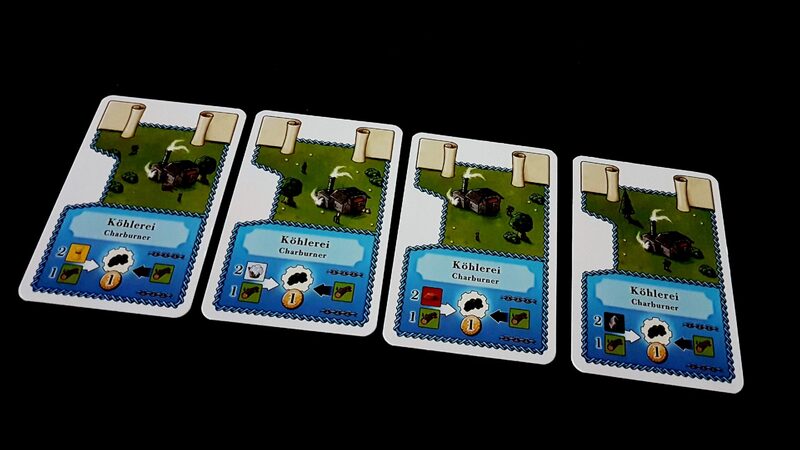 A worker producing sloppily can make do with one fewer component, but only gets one card produced as a reward. After the first draw of cards is made, you need to decide in what building your worker will go, and how hard they’re going to work. You also decide at this stage whether you’re going to construct a building – and that might depend in itself on how successfully you assigned your worker and apprentices. You might be counting on money that just might not materialise. This is the glistening jewel in the heart of Oh My Goods – the lens through which the brightness of all other systems pass and intensify. Here’s where you set yourself up for comic failures, comic successes, and comic misalignments of expectations. You’re betting here on a set of resources to appear, from an uncertain number of cards, with an uncertain distribution left in the deck. Card counting is meaningfully impossible because cards are money and goods and buildings and the churn is remarkable. It’s entirely possible all the wheat you need is locked up in goods cards, but you’d never know because they’re all face down. You might be betting on cards that simply aren’t available in the deck. You don’t know, but you don’t know that you don’t know. It’s easy here to fall into the trap of assuming distribution – ‘no wheat has come out in the past two turns, so we’re due a glut’. You might want to bet on that. And you know, you might even be right. You’re deciding, constantly, between taking risks and being conservative. If the day had slim pickings you might choose your least complex building and your sloppiest worker. That way at least you’ll make some progress. You might only get two cards in the afternoon draw after all, and with a sloppy worker you could at least sacrifice some of your hand to get something. Maybe you’ll get five cards. Maybe you’ll get eight. Maybe you’ll get a dozen. It’s possible, although not likely – on occasion the afternoon will spool on seemingly forever without drawing the two half-suns that mark its passing. Maybe you’ll find that you could have produced in all your buildings, with resources to spare, and you’re left moping at your char-burner with a crappy lump of coal to show for the day’s efforts. Still, it’s not all bad because there’s a secret sauce in here that dials everything up to eleven. A secret sauce that if you could get the taste for it you could turn even poor performance into profitable profligacy. 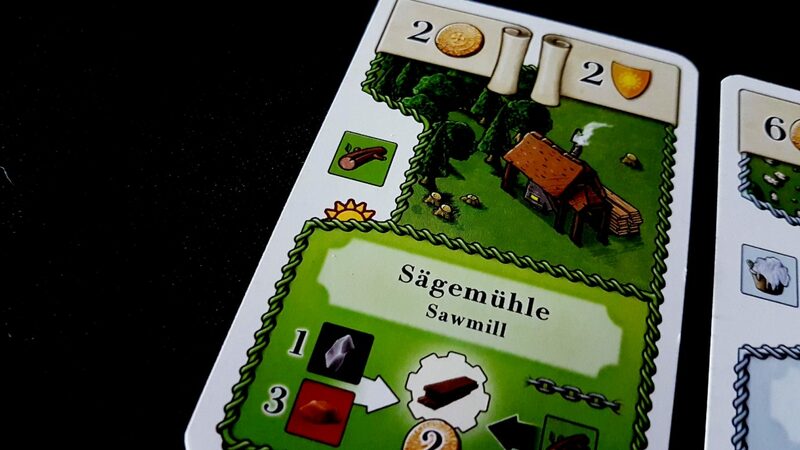 If you’re produced in a building during a turn you can trigger a production chain by throwing relevant cards from your hand, and any relevant goods, into the building. For example, our charburner lets us throw wood into the… furnace?… to produce additional goods. If we have a surplus of wood cards in our hand we might decide to turn them into coal, either for our other buildings, or for the coinage it would generate. However, production chains are tricky and sometimes they become quite complex. The longer a chain, the more profitable it can be. However, at the same time, it becomes intensely more difficult to get it to do anything at all. A production chain, combined with a compatible hand of cards, might turn the production of one good into the production of half a dozen. As long as you have the raw material, the chain can keep on chaining. The food factory in turn needs bread, which comes from coal, which comes from a charburner, and flour, which comes from a mill. To trigger a production chain in a higher tier building requires you to have all of the pieces of a sophisticated logistical system in place and working together. If you can do it though – well, eight coins is not to be sniffed at, especially since money also counts fractionally towards victory points in the final reckoning. 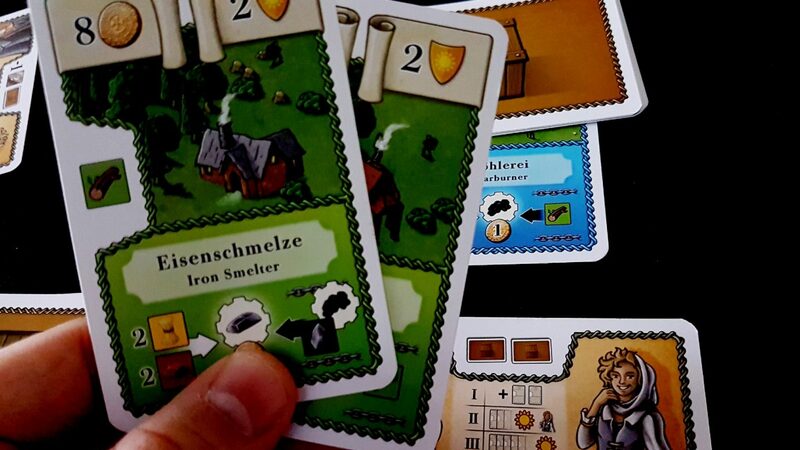 Eight coins is enough, by itself, to pay for a very meaningful portion of buildings in the deck. Every time you can take advantage of this particular chain, that could be two or three buildings you just funded. These production chains offer you a chance to super-charge your infrastructure. Other cards in the deck permit you to build some redundancy into the marketplace by developing the special cards that give you guaranteed, permanent supplies of resources. If you know you need a lot of wheat, then it might be a good idea to invest in reliable wheat sources outside of the random draw of the marketplace. As such, production chains give you a bit of grit around which the pearl of your engine can accrete. But here’s where we find the flaw at the core of Oh My Goods – it’s a game that has a strong emphasis on the synergy of production chains but it doesn’t give you the time, or the capability, to make use of them. The game continues until the eighth building is created, at which point everyone gets one last round and scoring is done. You’ve got eight buildings then to set up a chain, and all the infrastructure needed to support it, and no guarantee that you’ll ever have access to the key links you’ll need. If you only have a food factory and a mill, you’re screwed because you’ve no way to turn the flour from the mill into the bread from the bakery. Sure, if you get the three stone and three wheat you’ll trigger the normal production, but it’s the chains that really give play a blast from the spice weasel. Without the chains you’ve got a pleasant, but ultimately unremarkable, tableau builder. With the chains you’ve got something that brushes its fingers gently against true excellence. As it stands though you’ve got something that has the chains but doesn’t really make much use of them. You’re a titan of industry choosing what to build on the basis of availability rather than strategy. Your town planning isn’t based on a savvy read of the market conditions. It’s based on the cards fate dealt you. Even if you have the cards available to build an effective chain, you probably don’t have the resources until it’s too late to really take advantage of the system. Nineteen coins are needed to make a food factory, and coal is worth one coin per unit. 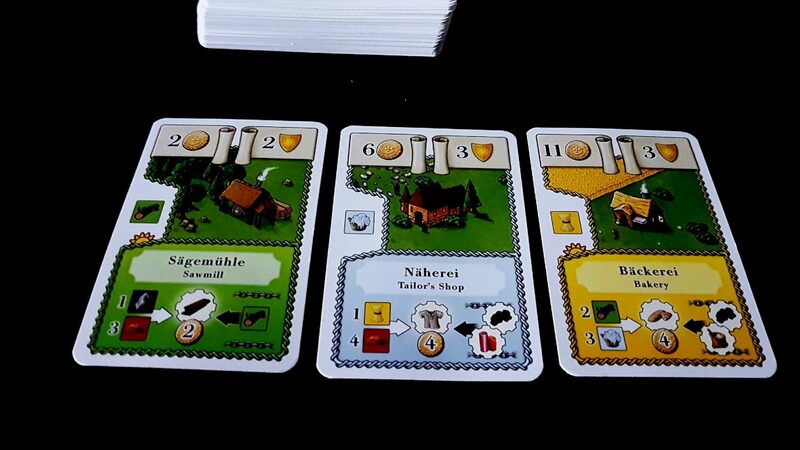 Before you can even think about building the food factory you’ll need a good four or five cards dedicated to your economy before you can afford it. 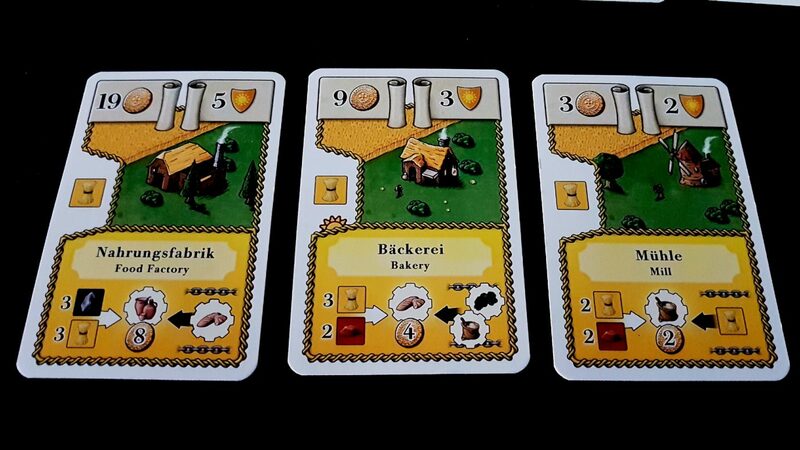 By the time you line up the mill, the baker, and the food factory the game is probably entering its final round anyway. All that work, all that effort, undermined by the fact you have no chance to enjoy the way your engine comes together in the end. 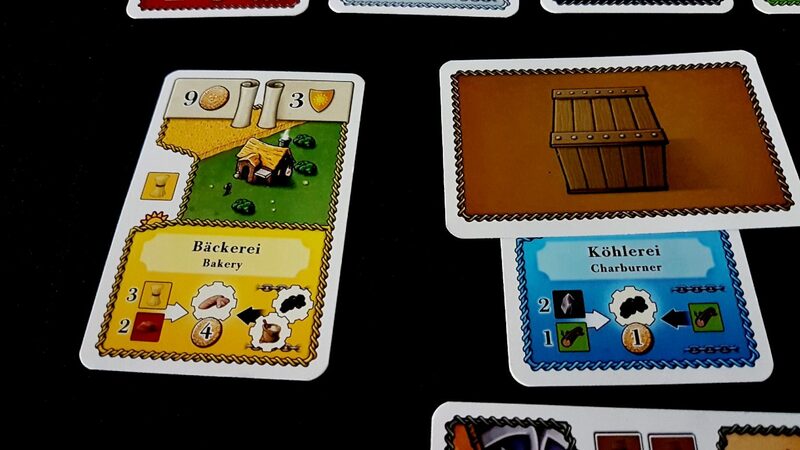 For half the cost of the food factory you could have bought three smaller buildings, earned more victory points, and still saved yourself nine coins. The incentives and the gentle elegance of these production chains is undercut by the unforgiving realpolitik of actual gameplay. In the end, those that play the best and accomplish the most efficient synergies of cards are going to find it the hardest to win. The cleverest part of this game then is the one that’s simultaneously best developed and least relevant. True though, this issue is only at its most pronounced at the end of a long chain and there’s scope for smaller, less lucrative progressions of goods to emerge as a result of lucky synchronicity. However, even in that circumstances the system breaks apart somewhat because many buildings need resources from two other buildings to trigger. You have one worker, and can perhaps supplement that worker with apprentices. That in itself depends on tableau composition and your chain may not be compatible with any apprentices available. At the lowest level, buildings trigger from cards in your hand. At any level higher than that, they’ll need at least one resource that came from a lower level card. Consider the iron smelter below. Sure, that iron smelter can trigger on stone and coal – and those are available to you. But to build it you’ll need to spend eight coins and those are going to come from the resources you’ve produced. If you build the iron smelter as your first act of construction, it’ll take you eight coal to do it. At that point, you can choose between producing coal and producing iron, but you’ll need to do them alternately. Otherwise you’re not going to have the raw resources you need to trigger the production chain. That is, of course, assuming they even trigger when you want them to. Remember, to a large extent the buildings that can produce are determined by the market – and the market has no obligation to produce in line with your desires. The production chains only trigger (except in the last round) when a good has been produced – the staffing and resource and infrastructure considerations here mean that it’s a bit like trying to throw a dart through an electric fan. Everything has to line up perfectly and the chances are pretty good you’ll just end up with a new forehead piercing for your efforts. When it does work though, it’s glorious. You produce efficiently in a building, giving you two goods you can sell for five coins each. Then you funnel in a pile of coal and some stone from your hand to give you another two goods. Then you sell all four of those goods to place down the factory that’s going to use up all the stockpiled bread you’ve made over the past few rounds. You might only have two turns left in the game, but when these systems cohere they have an emotional payload that is akin to a religious epiphany. You can get smaller chains working semi consistently, and within even those chains you have an opportunity to cultivate value. The problem is these small, occasional victories just remind you that the game doesn’t cohere enough to give you the promised catharsis. Oh My Goods says ‘just look at what you could do here’ and then stops before you get a chance to actually do it. The text of this review is probably a little at odds with the end rating, but that really should underline my point – the production chains, in my view, simply don’t work as would be expected. Imagine how good a game this could have been if they did. As it stands, Oh My Goods has moments of absolute brilliance that are studded with the frustrations of permanently delayed gratification. It’s a small box, short-duration game that has employed the gameplay conventions of something much bigger, and much longer. 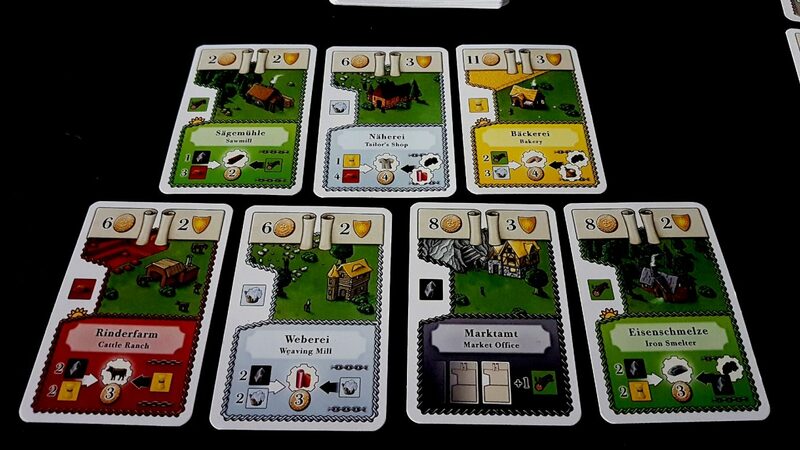 Unfortunately the solution isn’t as simple as ‘just play until you have more buildings’ – every other part of the game is balanced around the tableau as it stands. What is here is very, very good – a real genuine gem of a game that I have enjoyed the hell out of every time we’ve opened it up. It’s just I feel a real pang of regret that Oh My Goods is not in alignment with its own lofty, noble ambitions.